When guests would spend the night in our house they would claim that they heard frightening voices coming from inside the walls. Objects would be thrown across the room, and spiders seem to come from nowhere. My girlfriends brother whom lived with us complained that he couldn't sleep at night because the "conversations" were so loud that he simply could not rest. He believed in ghosts, and though he wasn't afraid of them, he said that it definitely felt demonic. Lights would come off and on by themselves, doors would open and unlock themselves. One night in our bedroom a viscous laughter emanated from thin air, and to this day I cannot explain the terror in that laughter. One night I was awakened by what felt like hands on my throat choking me. I could not breathe, I could not scream. After about 30 seconds it released it's grip and I gasped for air. The same thing happened to my girlfriend the next night. Another night me and her brother were standing just outside the back porch sliding glass door when we were talking about a supposed curse of their family. I abruptly exclaimed "I rebuke this curse in the name of Jesus Christ!" I no longer finished saying those exact words when a deafening sound and a vibration struck the entire house with such an alarming "boom" that the neighbors came over to ask if I had heard something strange. I knew it wasn't our imaginations, I got out the ladder to see what had landed on top of the house only to find nothing. Things settled down after that, and to this day I believe that whatever made that noise also caused the disturbance to go away... For awhile. My girlfriend broke up with me, and I met someone online in Michigan, where I moved up to be with her. She didn't believe in spirits, and although I knew better, I decided to make her a believer as well. Living in a very small town in Marshall Michigan there were no stores that sold Ouija boards so I downloaded one from the Internet. I printed it out, and to my horror ZOZO returned. It said it came from "cyberspace"...and when I asked it where it lived it spelled "SKULL NICKLACE"... We didn't think much of this until I asked it again where it was, this time spelling "MIRROR." The was only one mirror in the bedroom where we were crouched on the floor, and I heard a scream coming from her 7 year old niece who was watching us with another young friend. We looked up at the mirror and saw the skull necklace swaying back and forth with glowing eyes looking down at us! My new girlfriends son had hung the necklace on one of the posts of the water bed hours before I downloaded the paper board. We almost jumped out of our skin, and although 3 feet of fresh snow had fallen that night we all found ourselves in the front yard not knowing what to do, scared shiatless and frozen in terror. My girlfriend was so fascinated she drove 40 miles to purchase a new glow in the dark Ouija board much to my dismay. The next night we had another session in the same room. ZOZO immediately came forth, and even without me being a participant. My girlfriends nieces were using the planchette and I would secretly write down a color onto a small piece of paper, then crumple it up where NO ONE could see. I asked the young girls to ask the board if it knew which color I had written down, it quickly scooted to "YES!"..."BLUE!" I remember chills coursing up and down my spine as I threw the wadded up paper to my girlfriend. Her eyes widened as she read the written color BLUE! We then tried the same thing with shapes, and words and every time the board knew. One night we asked the board if the spirit would show itself. It spelled YES and told me to turn out the lights and take a picture of the necklace above the board. I did just that and what turned out is eerie to say the least. On the upper left hand corner of the picture you can plainly see "winged" skeletons flying about, and they are of the exact same weird shape of this "skateboarders" skeleton necklace. Towards the middle you can make out hideous faces, I have seen at least 4 evil faces in this picture. 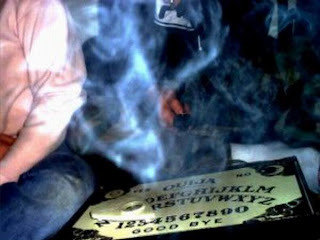 I took this picture about 6 years ago, people have stolen it off of paranormal websites claiming they took it, when I know truthfully it was me. I have sent this picture to several "experts" and they have all said they cannot explain the images inside. As if all of this wasn't strange enough now comes the REALLY scary part.